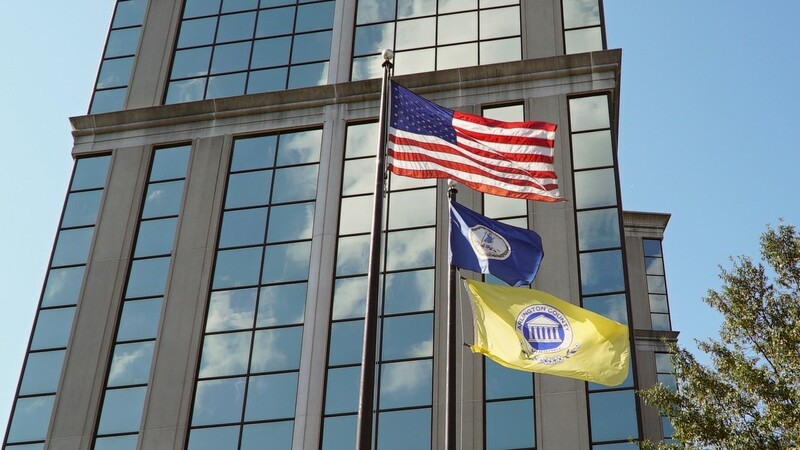 View the County Manager’s Proposed FY 2020 Budget. This post has been updated to reflect the County Board’s Feb. 23 advertisement of 2019 tax rates. County Manager Mark Schwartz today presented an overview of his proposed budget for the County’s 2020 fiscal year, which starts July 1, 2019. It includes a combination of strategic spending realignments and a 1.5-cent tax-rate increase to support enhanced investments in community priorities, including Schools, Metro, infrastructure maintenance, housing affordability and the County workforce. In all, the proposal details $1.34 billion in General Fund spending, a 3.7-percent increase in ongoing commitments compared with FY 2019. Counting $31.1 million in one-time funds, the increase amounts to 4.7 percent. Nearly 40 percent of the budget ($525.6 million) goes to supporting Arlington Public Schools. The remainder funds a broad range of public programs and services, from health and human services to libraries and parks. The County Board will now review the proposal, gather feedback from the public, and adopt a final budget at its April meeting. The Manager’s proposal reflects an effort over many months to review County services and programs to determine which ones need to be trimmed, and which ones need additional resources. The spending reductions and realignments it proposes focus on areas where service demands have declined, where there is another way to provide the service or achieve administrative efficiencies, or where the program is of lesser priority than new demands. The reductions amount to $5.2 million and would eliminate 29.5 positions, 18.5 of which are currently filled. The proposed 1.5-cent tax rate increase, which is expected to generate $11.7 million in new revenue, is consistent with the County Board’s guidance in late 2018, and specifically targets certain priority investment areas. Two-thirds (one penny, or $7.8 million) would go to Arlington Public Schools, to support costs of staff and related start-up costs at three new schools coming on line in September. The remainder ($3.9 million) would go to the County, to help fund additional school resource officers and nurses for new schools (5.55 FTEs), as well as competitive employee compensation. Housing Affordability: Growing the County’s Housing Grants and Affordable Housing Investment Fund programs, including $9.3 million in funding for Housing Grants, which would now be 100-percent funded with all ongoing funding (vs. one-time funding). Infrastructure Maintenance: $15.5 million to keep aging roads, bridges, water mains, facilities and other critical systems in a state of good repair (up from $5.5 million in FY 2019). Metro: $45.6 million to meet a 3-percent annual WMATA subsidy increase and to fund one-time labor arbitration obligations. County Workforce, including Public Safety: Increased pay for County public safety and general employees to attract and retain talented staff, and restoration of funding for 16 positions for the Police and Sheriff that were frozen in the FY 2019 budget. The investment priorities are also consistent with the findings of the County’s 2018 Community Satisfaction Survey, in which Arlington residents identified public safety, schools, transportation, public works and infrastructure, and Metro as top priorities. Over five months ago, the Manager estimated a budget gap of $20 million-$35 million for FY 2020, with a gap of $43 million identified by Arlington Public Schools. The budget situation improved for several reasons – chief among them were the increased real estate assessments completed last month, driven by a decline in office vacancy rates, surprisingly low cost for health care benefits for County employees and a number of cost efficiencies and projected higher interest earnings on the County’s investments. The County Board is now responsible for reviewing the Manager’s budget proposal and making changes before adopting a final version in April. At its Feb. 23 meeting, the Board voted to advertise a property tax rate increase of up to 2.75 cents (per $100 in assessed value) as well as increases to other fees for Calendar Year 2019. Between now and its April meeting, the Board will gather input from County staff, key stakeholders, and the public, including at two public hearings, scheduled for April 2 and April 4. Learn more about the County Manager’s Proposed FY 2020 Budget at budget.arlingtonva.us. Arlington County Manager Mark Schwartz will brief reporters on his Proposed Fiscal Year (FY) 2020 Budget on Thursday, Feb. 21.